Talk about a nostalgia trip! 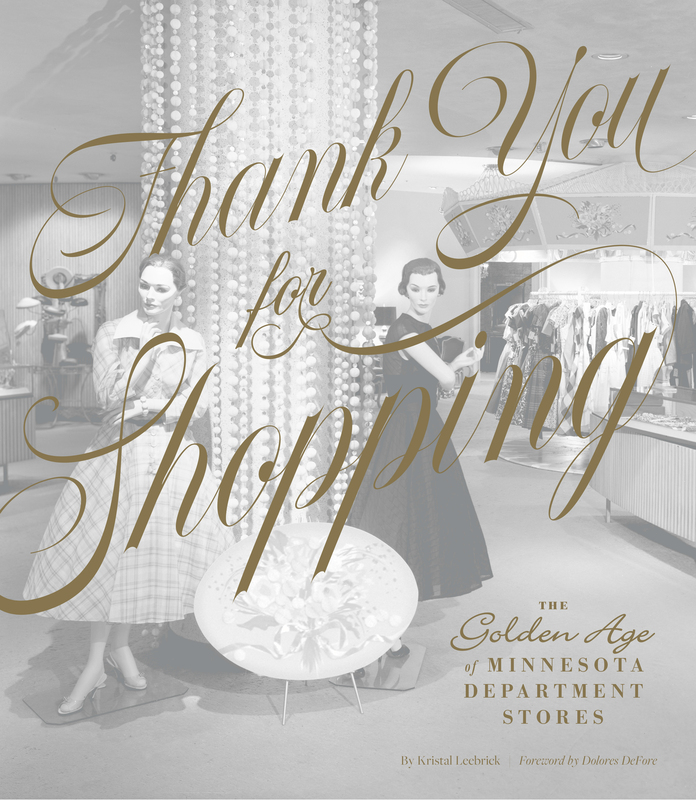 Open Kristal Leebrick’s new book, Thank You for Shopping: The Golden Age of Minnesota Department Stores, at any page and feel yourself—if you are of a certain age, anyway—drifting back to the days when Donaldson’s, Dayton’s, Powers and—sigh of sighs—Young-Quinlan were the places to shop. Not only for fashionable clothing, shoes, and accessories (Dayton’s Oval Room, anyone? ), but in many cases also for housewares, home décor, appliances, and so much more. Those holiday window displays! Dayton’s eighth-floor flower shows! The dining destinations: Dayton’s Sky Room, Oak Grill; Schunueman’s River Room; the Capitol Room at the Golden Rule; Young-Quinlan’s Tea Room. Have I lost you, millennials? Perhaps you remember Marshall Field’s, which was Macy’s, which was originally Dayton’s. Way before Amazon and other online shopping venues, the department store carried everything anyone would need, from a button to silver gravy boat to a monkey. Leebrick’s book captures it all with vintage photography, illustrations, postcards, and reminisces from former staff, including Dolores DeFore who ran the Oval room for many years. If you ever shopped at one of Minneapolis or St. Paul’s iconic department stores, or dined there, you’ll have stories, too. An accompanying exhibition at the Mill City Museum augments the book’s visuals. The exhibit opening and book launch celebration will be held Thursday, November 15, from 6-8 p.m., at the Mill City Museum in Minneapolis. Leebrick also ventures further afield, to write about department stores in Brainerd, Winona, and Duluth—among other cities. The stores embodied elegance, “with their high ceilings, elevator operators calling out the floor numbers at each stop, and salespeople at the ready in every department,” writes Leebrick. Shopping was an event, an excursion, an adventure—and was done in person. The sense of possibility, of discovery, of joy during a shopping spree a department store presented is fully captured in this lively book.